Protein Pancakes are a fantastic thing. You feel like you are eating such a treat, but in reality, you are eating something that is relatively good for you! 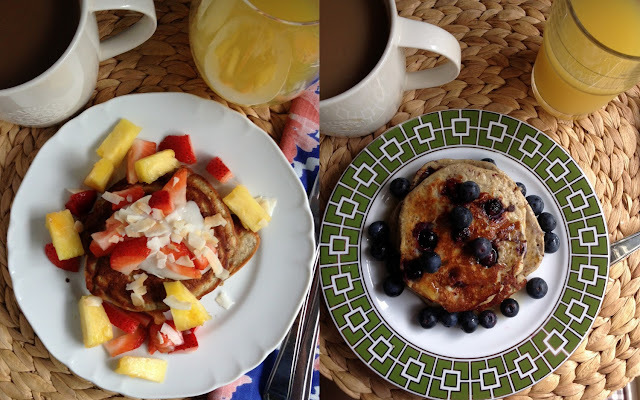 Full of protein and nutrients, these pancakes will help you start your day off right! This is a variation on the previous blueberry protein pancake that I posted, if you don't have protein powder at home, you can make those instead. I find that this version is just closer in texture to a regular pancake. I use Vemma's Chris Powell Bode shake powder in vanilla for my pancakes. Learn about my transformation with this shake here. Beat the egg whites slightly before whisking in the other ingredients. Cook over med-high heat until bubbles form in the batter, flip and cook for another 30 seconds to a minute. Top these with fruit, yogurt, coconut, nuts, whatever you want! I love protein pancakes! Can't wait to try your variation!